Last Saturday was Pixie’s 7th Birthday and since she absolutely adores Shimmer & Shine, she just had to have that as her party this year. 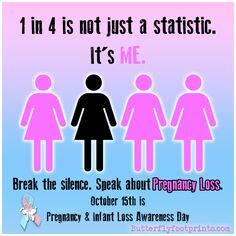 There is so little educational stuff out there for this theme, the few goodies I could find on Pinterest have links that no longer work. It’s Shimmer & Shine Party Time! 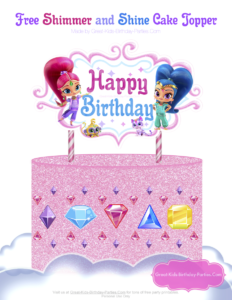 Have a glitter-tastic birthday party with these adorable twin genies! 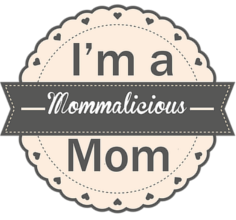 Let Shimmer & Shine bring glittery sparkle to your party with our awesome party printables! From invitations to party games, we have everything you need for a magical birthday party. 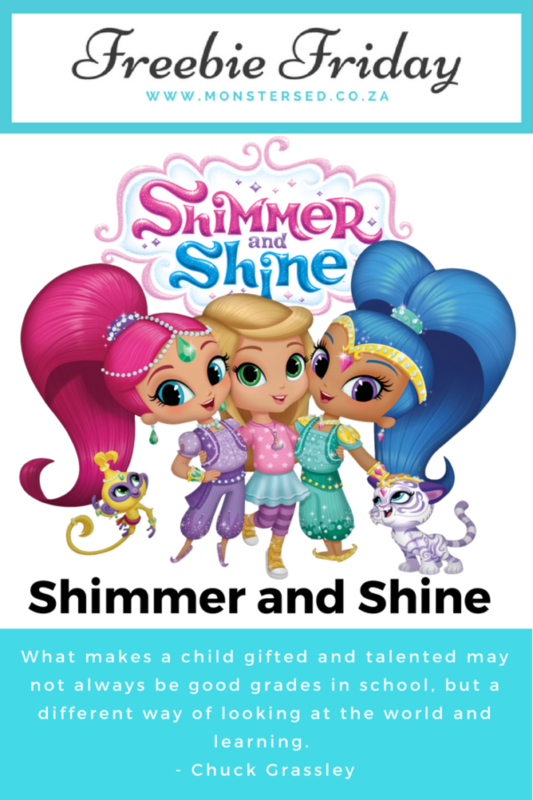 If you have a little princess safe at home is a fan of the new Nick Jr. Shimmer & Shine show, the show is super fun and full of good things so here I leave you several PDF’s with activities of these little geniuses to enjoy with your princess. Your wishes are granted with Shimmer & Shine. These little genies in training are optimistic and courageous and want to make Leah happy. They don’t always get it right but what fun would that be? 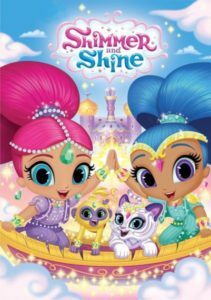 Join Shimmer & Shine and all their friends, Leah and Zac, Tala, Nahal, and more. 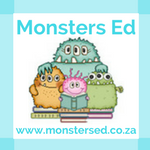 Have a magical adventure with Shimmer & Shine. There’s magic and friendship, adventures for all. 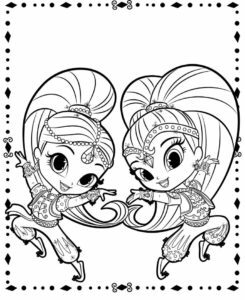 So print and share our Shimmer & Shine Coloring Pages with your family and friends. 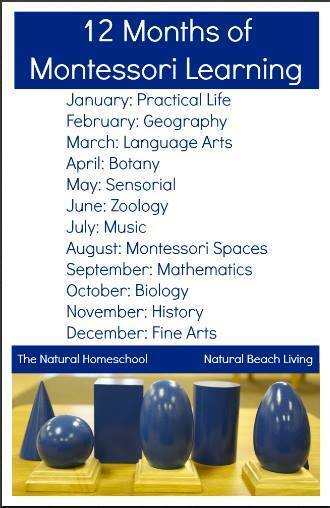 Turn on the show and color your day away. 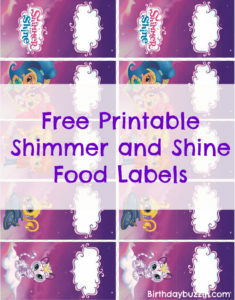 These Free printable Shimmer & Shine food labels are great for making labels and tents to place next to food you provide at your Shimmer & Shine birthday party. If your planning on creating a grand buffet for guests these will come in handy. 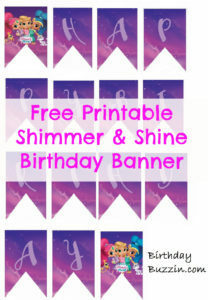 Decorate a Shimmer & Shine birthday party with this Free Printable Shimmer & Shine birthday banner template. The free Shimmer & Shine birthday banner includes all the letters to spell “Happy Birthday” and is formatted to print one letter per page. 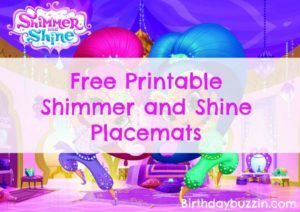 These Free printable Shimmer & Shine placemats template is perfect for decorating your party table, especially if you plan on throwing a Shimmer & Shine birthday party. 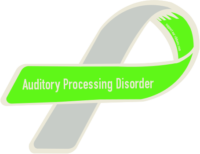 Although the template is primarily a placemat it can also be used as poster too. The design features Shimmer & Shine in their bedroom and is a high-resolution picture. Free Printable Shimmer & Shine water bottle labels to decorate the magic potions or refreshing beverages you want to serve in bottles to your guests, for a Shimmer & Shine birthday party. Use these free printable templates to label drinks and match them to Shimmer & Shine theme. 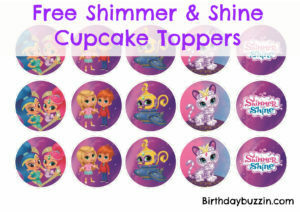 These free printable Shimmer & Shine cupcake toppers would be perfect for making your own cupcakes. If a Shimmer & Shine birthday party is what you are planning and you’re looking for something to decorate cupcakes, frost some cupcakes with pink and blue icing and pop these cupcakes on to the cupcakes for an easy finish. 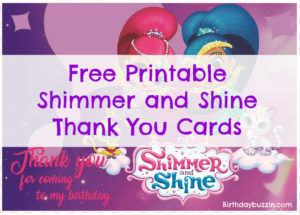 Wish your guests a big thank you for attending your Shimmer & Shine party with these Free printable Shimmer & Shine thank you cards. 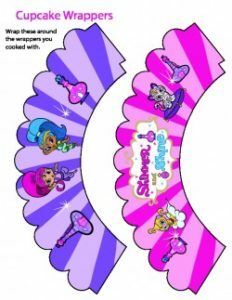 The templates feature Shimmer & Shine, their pets and the words “thank you for coming to my party”.